An interesting piece from the NYTimes on the topic of war photographers and the censorship around their work. Zoriah, an artist recently featured here on Epic Edits (and a personal acquaintance of mine), is featured in this article due to his recent issues in Iraq. Film photography is so awesome — here are some reasons why. Two great videos from Jim this week! A handy little discussion of tripods — the different types, and various ways to use them. And if you’re looking to get into macro photography on a budget, here’s an old trick for using some non-macro gear to give you macro capabilities. This is a massive list of links to various other lists of Photoshop tutorials, textures, patterns, brushes, etc. 19 great portrait photography tutorials spanning everything from general tips, composition, subjects, travel, models, environments, posing, hands, clothes, candids, and much more! Thomas is on fire this week with some great articles! Popularity tips and tricks from a Flickr-master — he talks about various ways of increasing your exposure and gaining attention via Flickr. Coming from a Bridge user, this review of Lightroom 2 by Thomas Hawk sure says a lot. It looks like the software has some great features to offer. A couple of new things from PhotoChallenge.org too! The July Challenge was on the topic of lights and lighting fixutres — check out the results! (unfortunately, I started this one but didn’t finish). The next PhotoChallenge (scheduled for the month of September) will be on the topic of portrait photography, and I’ll be one of the three judges for a contest portion of it. Some exciting speculations and predictions for the Photokina event — it looks like we’ll have all sorts of new toys to play with in the next year. Jeff Revell goes over some tips for photowalking, including how to prepare, what to bring, and how to have a little fun. Here are some fun ways to get creative with a fisheye (or other wide angle) lens. A great explanation of the “in camera” technique for producing photos with pure white backgrounds. This entry was posted in Roundup and tagged background, censorship, Film, fisheye, Flickr, iraq, lightroom, links, macro, News, photochallenge, photography, photokina, photoshop, photowalking, portrait, Roundup, tripod, video, war on August 3, 2008 by Brian Auer. A tripod is not a single piece of equipment, but rather, two components joined together: the legs and the head. 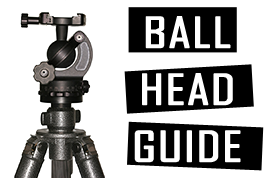 In this article, we’ll explore a specific type of tripod head called the ball head, or more formally the ball and socket head. A tripod head, in general, is the piece of equipment that sits between your camera and the tripod legs. It is responsible for providing an adjustable yet rigid connection. It’s also the part of the tripod that you, the photographer, will have the most interaction with. A recent poll here on Epic Edits indicates that 60% of you are ball head fans when it comes to your tripod heads. But for those of you who aren’t on board already, read on! A ball head is a ball and socket joint that allows rotation about a single point in all directions. They are typically more compact than a traditional pan/tilt head or other forms of tripod heads because they only require a single mechanism for locking the motion. But rather than try to describe how a ball head works, I found this video that does a decent job at showing how they work and how they move. The ball head in this video is equipped with more features than you might find on some other heads. Panning capabilities and quick release mounts are not inherently available on all models of ball heads. For further reading on ball heads, tripod heads, and tripods in general, see the following articles: Tripod Heads 101 and Choosing a Tripod or Monopod. One of the major advantages of using a ball head is the simple operation it provides. A single knob is faster and easier to operate than multiple handles and levers. While one hand takes care of the knob, the other can be on the camera and positioning it as you look through the viewfinder. When you find that spot you’re looking for, give it a twist and away you go. In addition to the simple activation of controls, the motion provided is equally elegant and simple — you might even say intuitive. A full range of rotation means there are no limits to which direction you can point the camera, and the motion feels quite natural and uninhibited. Your own hips and shoulders work on the same basis as the ball head: the ball and socket joint. But besides the ergonomics and ease of use of the ball head, they’re also generally more compact than a pan head. There are no adjustment arms that hang off the head, and the single socket can be designed to occupy much less space than three separate hinge joints. Now of course there are downsides to every good thing out there. In the case of the ball head, it’s mainly the price. For a ball head of equal quality and capability to a pan head, the ball head will almost always cost more money. The main reason they cost more is because that precision ball and socket joint is much more difficult and expensive to manufacture than three decent clutched hinges. 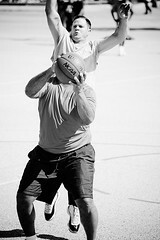 The other downside of the ball head is with the strength and precision. Ball heads that are comparable in price to pan heads will typically support less weight (important for folks with big heavy lenses). The motion and the ability to stop the motion will also be of lower quality and capability than the pan head. It’s not to say that you can’t get a ball head to carry a heavy load with smooth operation — it’s just going to cost more. Another disadvantage of some ball heads is in the lack of a panning mechanism. Higher end models will have this capability, but many will not (or they’ll do it poorly). And if they do have a panning option, the control for this motion will almost always be a second knob, lever, or button. So if you’re into serious panorama shooting, you might want to hang on to your pan head (or even a specialized panorama head). If you’ve ever shopped for any kind of photography equipment, you’ll know that there are enough options out there to drive you nuts. Things are only more difficult if you don’t know what features you should be paying attention to. So if you’re looking to purchase a ball head, here are some things you ought to consider. If you’re shooting with a big heavy SLR and a gigantic telephoto lens, you’ll need to know your weight and check that the head is capable of carrying it. On the flipside, if you’re using a compact camera, you don’t need to spring for the head that can carry 45 lbs. Check to see that the head can tilt to a full 90 degrees — most have a groove for the shaft to fall into that allows for this. If it doesn’t, you can’t frame vertical shots without really tweaking the tripod legs. And if you’re concerned about panning, you’ll want to look specifically for that added feature. All ball heads need at least one knob or other control, but some will have more. Generally, those extra knobs are for added features such as panning and other types of limited movement control. These are usually good things, but if you don’t need those features, don’t pay for them. Every ball head manufacturer seems to have a different way of attaching the camera. One thing to pay attention to is what the ball head offers by way of a quick release or some other mechanism. No two types of quick releases are the same, so keep your eyes peeled for good reviews — or hit the camera store and try them out. Just as important as the camera attachment is the tripod leg attachment. Make sure the ball head you’re looking at is compatible with the legs you already have (or are also looking at). Most of them are pretty standard connections, but some have specialty setups. If you’re unsure, buy the two as a set or at least stick with the same brand. And finally, don’t forget your budget. As with any photography equipment, you get what you pay for — but you still need to set your limits. Place boundaries on your spending before you start getting attached to a new ball head, but if you’re serious about making an investment on this piece of equipment, allot yourself as much as possible. WHICH BALL HEADS ARE SUGGESTED? In the end, a ball head isn’t for everyone. If you’re unsure whether you’ll like this type of tripod head, find a local shop that carries one — try it out. And those of you who are already using ball heads, do you have any additional advice regarding these things? This entry was posted in Equipment, Features and tagged ball head, ballhead, buying guide, camera, camera equipment, camera gear, digital photography, Equipment, guide, photography, tripod on May 12, 2008 by Brian Auer. Since we just talked about tabletop tripods, it got me thinking about tripod heads. Personally, I’m a fan of ballheads, but some people swear by 3-way panheads. So which is it for you? And why do you have that preference? I’m sure there are a few folks out there who are looking to get their first tripod, and having some insights on tripod heads would be helpful. Also be sure to check the results from last week’s poll having to do with autofocus methods. Almost 50% of us use “Single Shot” autofocus, while 25% use “Auto”. And as always, take a read through the comments for some additional insights from fellow readers. This entry was posted in Equipment, Reader Poll and tagged art, art and photography, autofocus, ballhead, digital photography, Equipment, panhead, photography, poll, question, quiz, tripod on April 29, 2008 by Brian Auer. Sometimes it’s not convenient to carry a tripod with you — especially the big bulky sturdy pieces of equipment that some of us like to use. But not every occasion requires a heavy duty tripod, and something much smaller will suffice. A while back, I picked up one of these tabletop tripods (well… my Mom got me the Sunpak Mini-PRO Plus for Christmas). It’s really nice to have since I rarely want to carry my Slik Pro 700DX equipped with the Slik AF2100 Pistol Grip Ballhead because it looks like a rocket launcher and weighs as much as a tank. My tabletop tripod, however, fits in a lens compartment in my camera bag and I can use it in a pinch. Of course, if I want to do some serious landscape or sunset work I’ll break out the big guns. 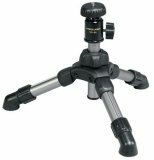 Most tripods in this category are about the same size and price — approximately 7 inches folded down, about 12″ fully extended, as big around as a typical lens, and under $30. One thing to look out for when researching one of these tripods: make sure it can hold the weight of your camera — some are intended for compact cameras while others are capable of supporting a dSLR. So if you’ve ever found yourself without a tripod in a time of need, check out some of these tabletop versions shown here (especially the one at the top of the post… it’s new and it looks awesome for dSLR users). This entry was posted in Equipment, Quick-Tip and tagged camera, compact, compact camera, digital photography, dslr, Equipment, foto, gear, mini tripod, photo, photo gear, photography, photos, slik, tabletop tripod, tripod on April 28, 2008 by Brian Auer.